Dressed and ready to go! 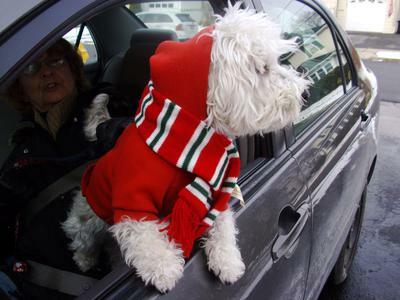 Pogo is all dressed up in his winter hoodie and scarf - ready to go for a car ride with Grandma. (she worries that his ears will get too cold so we put his hood up!) Every few days she will come and drive him around the neighborhood - it is one of Pogo's favorite things to do. I'm guessing there are others who enjoy riding too? Comments for Dressed and ready to go! Pogo is so adorable! My Charlie loves to go riding, and gets really excited when we ask him if he wants to go! He especially loves riding with his daddy in the MGB convertible around White Rock Lake! I wish I could attach his pic in the car! Enjoy sweet Pogo. We love our Charlie soooo much! Just to let everyone know....we always make sure his leash is secured and he is only allowed to stick his nose out during his short rides. The photo was to show his outfit. I know a crate or safety seat is safer, and for longer trips we do that. Grandma only goes around the block. I have seen dogs hanging out the back window of a car and totally unrestrained and it scares me. You are so cute and look nice and warm. yes, my girls love to ride also. They ride in their crates which are seat belted in and are great travelers. They know dairy queens and other places where they get something good and also the way to the vets which they do not want out of the car. Smart girls. So nice to see you Pogo! Has anyone had any success with booties? Quinn could use some protection from the snow and cold. Pogo is adorable. I love his sweater & scarf. That sure is nice of grandma. Jonah loves to ride. He just lays still on the back seat until we get to destinations thou.